(Nanowerk News) Atomic force microscopy (AFM) is a highly sensitive form of microscopy that makes it possible to map a surface with near-atomic resolution. Shaw Wei Kok and colleagues from A*STAR's Singapore Institute of Manufacturing Technology have now developed an AFM measurement method that can improve the sensitivity of the technique even further ("Shear-force atomic force microscope by using the second resonance regime of tuning fork probe"). The researchers' new measurement method is based on the standard 'tuning fork' shear mode—one of the many modes used in AFM. In this mode, an atomically sharp probe is formed on one arm of a quartz tuning fork and set into high-frequency resonant vibration. When the probe is brought close to the surface of a sample, the interaction of atomic forces gives rise to a shear force that slows down the vibration. By monitoring this signal, the probe and surface can be kept at a constant separation using an automated feedback system, allowing the height profile of the sample surface to be scanned with atomic-scale resolution. 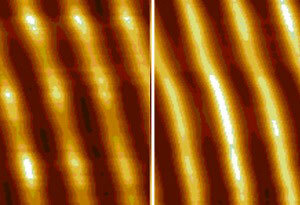 Atomic force microscope image measurements of the same structure in conventional shear mode (left) and using the second resonance regime (right). The maximum imaging resolution that can be achieved by tuning fork-based shear-mode AFM is limited by the Q factor of the tuning fork, or how easily the fork 'rings'. The problem, according to Kok and his colleagues, has been that research into improving the Q factor has relied on the resonant frequency of the probe in free air, which is not the same as that when the probe is nearly in contact with the surface—so during scanning the probe is effectively operating off-resonance. The researchers discovered that feedback control using the second resonance of the probe when near the surface provides higher sensitivity than that using the first, free-air resonance. "This discovery arose when at very close distances to the surface the behavior of the tip oscillations was contrary to the expected behavior," says Kok. "The traditional model of a tuning fork could not explain the observed behavior. Based on an alternative quantitative model that we developed, we found that the sensitivity should be higher in this second resonance regime." When operated in this second resonance regime, the resolution of AFM increased considerably, and finer structures could be resolved (see image). The development paves the way for fundamental investigations, says Kok. "We will leverage the sensitivity obtained using the second resonance regime to investigate atomic shear force interaction between the AFM probe and the sample," he says. "The results will help us to explore material characteristics at the nanoscale, and could lead to the discovery of new physics."